The first day of South by Southwest is completely bonkers: the city starts to shut down, the locals get aggravated and for the first year President Barack Obama provided interactive badge holders the chance to bask in all of his glory and urged the tech industry that they can affect change. It was, no doubt, a momentous occasion that was important, but it took a bit of the spotlight away from why we come here: to watch films. Keep in mind, this is the time studios get free marketing in a carousel of major releases. At SXSW you have to be careful when you choose your ultra-indies that are seeking distribution and festival favorites. EVERYBODY WANTS SOME! !, Richard Linklater’s spiritual-successor to DAZED AND CONFUSED, opened the fest in a big way last night. The air in the Paramount Theatre crackled with an electric fever as the lights came up and the end credits rolled off the screen. Linklater has been carrying the torch for the Austin film scene for over 20 years. As festival director Janet Pierson introduced the opening night film, Linklater humbly dotted “I’ve had films here before, but this is the first time I’ve opened the festival” to a giddy crowd. Even actors Kurt Russell and Ethan Hawke were in attendance. The premiere was part celebration of the film and part tribute to Linklater, who has been filming in the sun-scorched streets of Texas since his breakout film SLACKER in 1991. But the cool thing about his latest is you don’t have to be over 35 and or an appreciator of the ’80s lifestyle to admire Linklater’s aesthetic. It’s got a certain allure that makes it hard not to smile. You’ll slowly begin to notice a smirk to appear when the cast breaks out into a lip-sync rendition of the 1979 rap hit “Rapper’s Delight,” by The Sugarhill Gang. 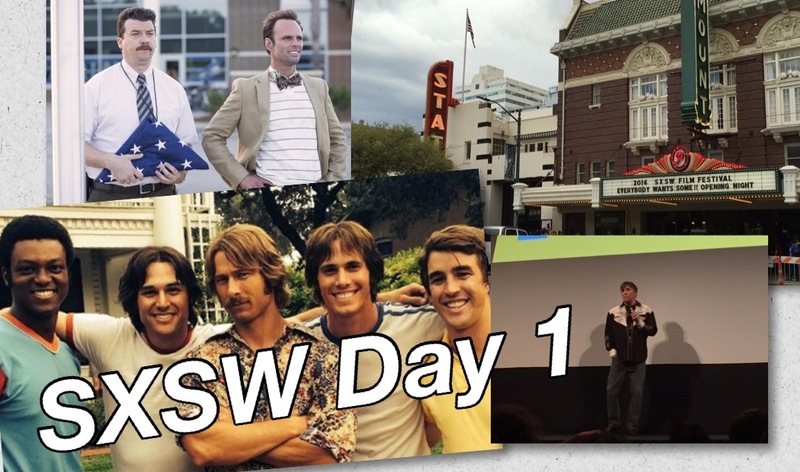 Based on Linklater’s time throwing around a baseball at Sam Houston State University in Huntsville, the film follows a group of baseball players at a fictional Texas university that pass the time partying and putting each other through hazing situations. “Almost everything in this movie, more or less, really happened,” said Linklater during the film’s post-screening Q&A. Linklater even gave a quick shout out to his fellow college teammates before his cast gave insight into their experience of working with him on the feature. Linklater is a bit of a genre chameleon. He has always been completely unpredictable as a filmmaker. Whether he’s directing a 12-year epic about a boy growing up in Texas (BOYHOOD) or making a film about a struggling marriage (BEFORE MIDNIGHT), Linklater makes movies for himself, leaving us eager for his next outing. It’s hard not to get a fear of missing out when events overlap and on the television front. Things have been heating up commencing with HBO’s new dark comedy VICE PRINCIPALS, which premiered at the Alamo Drafthouse Ritz located on 6th St. Starring Danny McBride and Walton Goggins, VICE PRINCIPALS is a dark comedic series created by Rough House Pictures (EASTBOUND AND DOWN, OBSERVE AND REPORT). It puts the two actors against each other as they compete for popularity in a high school. The stars described their onscreen partnership as unnerving, while pushing racial boundaries on campus, but all either want is a friend. This is a particular brand of comedy that takes time to build, but thankfully, audiences don’t have to wait too long to find out how much of a knee-slapper it is. The series will makes its debut this July on HBO. The midnighters section is for those who are those night owls with a sense of adventure. EVIL DEAD (remake) director Fede Alvarez was brought on to premiere his second film, that was marketed as UNTITLED FEDE ALVAREZ/GHOST HOUSE THRILLER. The suspense was taken out of the room when unceremoniously the title of the project was announced as DON’T BREATHE. Alvarez gave a rousing speech saying “this is really my first film, it’s a personal project that I am so excited about because you don’t know sh*t about this film.” Unfortunately, his speech was the best part of the event. DON’T BREATHE took elements from recent thrillers and used recycled tricks seen in home invasion thrillers with stilted dialogue, but kudos must be given for Alvarez’s passion. Check back for Day 2’s recap tomorrow.